This page will contain information and links about Dove Creek and the Four Corners Area. We're sure that once you experience the taste of the great Southwest in our products you'll certainly want to visit us ... and maybe even move here! Here is a map to get you started and a link to some information about Dove Creek. Check back soon for the completed page! We are located in the archaeological center of the U.S., between the Grand Canyon and Grand Junction, in Western Colorado. It is a beautiful agricultural plateau: once the home to thousands of Anasazi Indians who lived here for centuries, cultivated corn, squash and Anasazi bean, and built spectacular cities at Hovenweep, Chaco Canyon, and Mesa Verde among others. 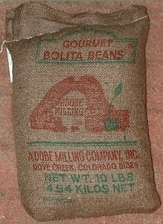 Today the area still thrives agriculturally, and we are known as the "Pinto Bean Capital of the World". In addition we are bisected by the Dolores River and its stunning canyons, enjoyed annually by both rafters and sightseers. The hunting and fishing are also outstanding. If you are out travelling in the Southwest, be sure to stop in and see us. Our home office and "One Stop Bean Shop" is open weekdays from 8:00 - 5:00. The popcorn is fresh and hot, and we are always game for some conversation.